It was like a scene from a film, the way we met. A blazing Sunday in June, two summers ago. Hereford train station. I was heading back to London from the Hay festival, and the train was about to leave. I leapt out of the taxi, raced on board and took the nearest seat in the carriage. It was then I glimpsed her, sitting opposite me reading a paperback copy of Mary Barton. As the train trundled through the English countryside my gaze kept flicking back to the woman with the wild green eyes and golden hair. She smiled, and we started talking. Her name was Bridget, and she was a 30-year-old speech and language therapist living in London. It was easy to talk to her – she was engaging, entertaining and, thankfully, she did not work in the media. When she revealed she was learning Hindi, that sealed it. As the train pulled into Paddington I told Bridget I wanted more than a brief encounter; I gave her my number and two days later she got in touch. I assumed Bridget would be nothing more than an uncomplicated distraction. Growing up in a working-class Pakistani Muslim family, I had been raised to expect an arranged marriage. I was the second youngest of four children and both my brother and older sister had had them. When we were teenagers in the 80s, my best friend Amolak and I would prowl the Arndale Centre in Luton and debate whether it would ever be possible to satisfy both our families and our hearts. I had grown up knowing that few things would disappoint my family more than my having a white girlfriend. 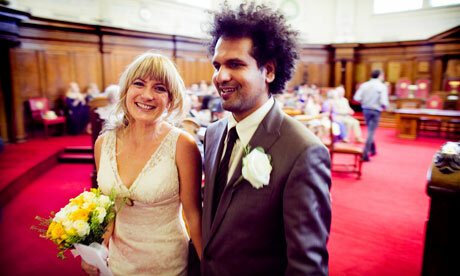 Marrying one was unthinkable – beyond the pale – and so by my 30s I was set on trying to find someone who would tick both boxes: British enough for me and Pakistani enough for my family. By the summer of 2008 I was about to turn 37, and emerging from a three-year relationship with a British-Pakistani woman; the plan was for some no-strings fun before resuming the search for the elusive British-Pakistani Miss Right. Bridget was going to India for seven months that autumn; in the meantime she could be my blonde distraction. I kept telling myself that our relationship was doomed, but the more time we spent together the closer we became. Bridget shortened her trip to India to four months and I went out to spend the last six weeks with her. On returning home I felt certain I loved her but did not know how to respond to my feelings. There were so many challenges. I was nervous about having mixed-race children and worried about my cultural heritage being lost rather than passed down. I also didn't want to become the cliched middle-class ethnic minority who confirms his entry into the establishment by marrying white. Most importantly, I did not want to have to live with the scalding guilt of knowing I had let my family down. I shared my doubts with Bridget and she listened carefully before pointing out that I was talking rubbish. "You were born into a fully Pakistani family and look how you turned out," she said; and for all my traditional upbringing I had still grown into a reasonably well-integrated and westernised adult. She also noted that my father, who had died in 1995, had, in his own way, been a pioneer: the only one in his family to leave Pakistan for Britain. Was it so wrong to be have found someone I cared about, and who cared about me? The more I listened, the more Bridget began to make sense. If she, as a white, nominally Christian Scottish woman, was not agonising about being with a brown, vaguely Muslim British Pakistani man, why was I so nervous about being with her? Bridget and I had been together seven months before I told my mother about us. I had been trying to soften her up with broad hints about how I didn't think I would ever find a British-Pakistani woman who would be right for me. And then, one icy January afternoon, we were both sitting in her living room with a Pakistani soap opera on the television when my mother asked, "So who is this white girl you are seeing?" I thought about denying it all but decided on full disclosure. She seemed to take the news astonishingly well. She mentioned that it was essential Bridget convert to Islam but I carefully side-stepped that issue and instead pulled out photographs of my girlfriend in India riding elephants, making chapattis and generally acting almost Asian. My mother urged us to marry. "You're not getting any younger," she said. "Marry her before she changes her mind." I went back to London, told a delighted Bridget and we had a celebratory curry. Some months later I took her to Rome and it was there, under a full moon, that I asked her if she would consent to be my wife. When we returned to Britain I told my mother, and she agreed to attend the wedding. She mentioned again that it was crucial that Bridget convert to Islam and, again, I changed the subject. Although my mother had seemed relaxed, when I spoke to my younger sister I discovered that this had been merely a front, and in fact she was deeply unhappy that I was marrying a non-Muslim. She was not sleeping and skipping meals. The rest of my family were equally opposed. Living in London it had been easy, surrounded by liberal-minded friends, to assume everyone thought like me. In Luton relationships like the one between Bridget and me were rare and dangerously radical. My brother and his wife live next door to my mother and younger sister (my older sister is relatively nearby, in Bedford). The world in which they exist is largely made up of other working-class Pakistani Muslims. How would they explain my marriage to the people they would run into at the halal butchers? When I came to Luton, I would be summoned to family meetings attended by my brother, his wife and their two children, along with my mother and younger sister. It was not Bridget they blamed, but me: the fact it took a white woman to make me happy was evidence of how far I had strayed from who I once was. "There's nothing Muslim or Pakistani about you," my brother said. "You can write books about how much your family mean to you [he was referring to my childhood memoir, Greetings from Bury Park] but we know the truth. The only time you even think about Islam is when you are in the media pretending to be a Muslim." Despite their fierce disapproval, my family would still be attending the wedding. It was important the family be represented, out of duty if not support. Bridget and I set about planning our British Muslim/Scottish non-denominational sort-of-spiritual wedding. For the reception we chose the Garden Museum, a beautiful converted church in Lambeth, south London, that overlooked the Thames. With me being vaguely Muslim and Bridget vaguely Christian we toyed with hiring a klezmer band to play vaguely Jewish music, but in the end we constructed a playlist that included a generous sprinkling of Bollywood songs and 80s classics for me, and some more contemporary songs for Bridget. It was inevitable that alcohol would be served – Bridget is Scottish, after all – but the food would be halal and Pakistani. In July Bridget and I went to Yorkshire for the wedding of Amolak and his white, Yorkshire-born girlfriend, Amanda Jane. Amolak had been dating her for more than five years but had only recently mustered the courage to reveal the relationship to his parents. His wedding was attended by his entire family and, during the evening disco, I watched as his elderly turban-wearing father took to the dancefloor, his arms draped over the shoulder of Amanda Jane's father. I was delighted. Such are the strange symmetries within lives that Amolak and I were both getting married within five weeks of each other to kind-hearted blonde women from the north. Two weeks before my wedding day my phone rang. It was my brother telling me that my mother had changed her mind. The wedding would make her too uncomfortable; she simply could not accept her son marrying a non-Muslim, and she did not want to be the only one there distressed by the day. My mother had always insisted that she would not support any wedding unless Bridget converted but I had maintained that religious conversions are insulting unless they are genuine. Religion was far from the only issue; in choosing a white woman, I seemed to them to be saying that a Pakistani woman was not good enough. Both my brother and older sister now had teenage children: if they were to endorse my marriage to Bridget, how could they ensure their own children did not follow suit? My mother had wanted me to marry someone who could easily fit into the family, someone to keep her company, someone who was one of them. As the day got closer I awoke every morning at three from traumatic dreams. In one, my brother and sisters appeared as ghosts; I could see them but knew they were dead and I was crying out to them saying, "Please don't die! I don't want you to be dead." In another I was sharing a bed with my older brother, just as I had when I was a small boy, but this time we were adults. In the dream I howled with pain that the brother I had once worshipped was not willing to witness my wedding. I sat in the darkness, my heart pounding as Bridget slept silently at my side. I spent the night before the wedding alone in my flat leafing through old photographs. I stared hard at the faces, and wondered how the ties that had bound us together had unravelled. The phone vibrated. A text from my younger sister. How was the wedding planning going? I told her I was distraught about my family. As we continued texting I realised my sister wanted to attend the wedding. I rang her and she told me what had changed her mind. She had been listening to Walk Like a Man, a Bruce Springsteen song about a wedding that we both loved, and had been reduced to tears recalling how once we had been inseparable. I wanted to relate my nightmares, but found myself crying as I tried to describe them. I put the phone down. Once I had collected myself I called her again. "Let me talk to the others," she said. I awoke on the morning of my wedding day still not knowing whether my family would be there. There were three different seating plans, depending on what was decided. My wedding speech was still unwritten as that too would be influenced by who was in the audience. My sister rang. There had been a two-hour family conference the previous night. It had been decided that both my brother and older sister, as well as their respective families, were not coming. My mother would come with my younger sister. This, I knew, was only down to my younger sister's persuasion, for which I will be for ever grateful. "Hurry up and get on that train," I told her. "There's less than two hours to the wedding." In the domed central chamber of Islington town hall, where the civil ceremony would take place, I stood waiting for the woman who would be my bride. Out of the corner of my left eye I could see my sister and mother. Throughout all the pain and sadness of dealing with my family, Bridget had supported me, and her family had been equally sensitive – their sadness at the prospect of my family missing the wedding coupled with a sense of powerlessness. And so it was especially moving to see Fran and Bob, Bridget's mother and father, sitting quietly with them. Jackie DeShannon's When You Walk in the Room struck up, and slowly Bridget walked in dressed in an antique gold lace dress that made her look like a fairytale princess. The registrar spoke words I had written, Amolak did a reading of lyrics from a Bruce Springsteen song, Bridget and I made our vows and slid rings on each other's fingers and, to a soundtrack of the Beatles' All You Need is Love, we signed the papers that made us man and wife. At the evening reception in the Garden Museum, the hall thrummed with warmth and affection. Fairy lights twinkled on the trees in the garden. Flowers arranged by Bridget's mother adorned the banqueting tables, which were named after iconic albums. I sat on Born to Run, with my mother to my right. As she tucked into the egg curry and chicken jalfrezi, friends and Bridget's relatives flocked to tell her how happy they were to see her. My mother had said she and my sister would be leaving at the end of the meal. In fact they were there to hear the speeches so I could thank them publicly for turning up. They stayed until 1am: my sister danced to Lady Gaga, my mother talked in broken English to Bridget's parents, and in basic Urdu to Bridget. At times during the evening I would stop and look on in wonder. It did not seem real. My white wife, my mother and me. All in the same room and smiling. In fiction, characters go on journeys, they are changed by events. In real life characters often remain stubbornly immune; life-changing events can leave lives oddly unchanged. In many ways my relationship with Bridget resembled a movie – the chance meeting on the train, the wedding proposal in Rome, the turbulent will they/won't they of my family's attendance – but real life is not a movie. My brother and older sister stayed away on my wedding day. I truly believe that if they had come, they too would have been moved by the love and warmth that radiated through the day. I look back on their non-appearance not with anger, but great sadness for them and for me. The day after the wedding I rang my mother. "Everyone was so friendly," she enthused. "The food was so good too. I had a very nice time." I don't yet know whether my family will, in the end, come to love Bridget as I do. I know that on a recent Saturday evening my younger sister had a birthday meal to which she invited Bridget, and that the next day she and my mother came to London for afternoon tea with us in St James's Park. I know that, when I asked my mother how she felt after the wedding and whether it had changed anything, she said simply, "The anger has gone." And I know that once the anger has departed, there is always a hope that love and acceptance can take its place.